I may not know where the band is going with my songs but one of my musical strengths has always been that I’m best creating spontaneously. Throw something at me and I can make immediate sense of it, like I can put a melody over chords the first time I hear them. So my plan is just to listen for what the band’s doing and react instantaneously. 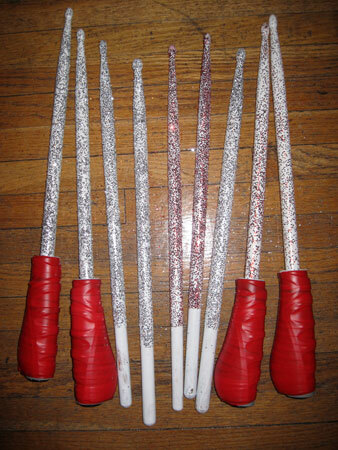 At least the hundreds of musicians in the band will be able to clearly see what I’m doing because I just got done attaching bicycle handlebar grips and glittering my batons or whatever you call those sticks conductors use to conduct with. 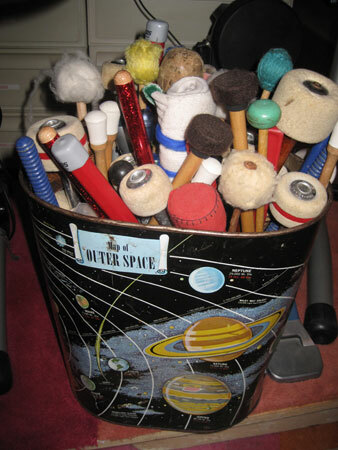 I always have a lot of drumsticks and mallets on hand. All the plain drumsticks are missing because they’re going to the football game with me. Which brings me to the main reason why I’m so excited to conduct a marching band. 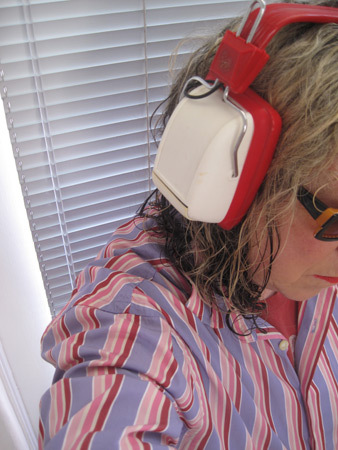 First, I’m elated, of course, that they’re playing my songs. But even moreso, I love marching bands. 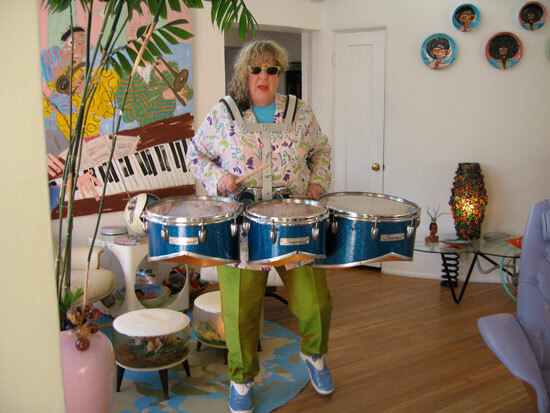 And I especially love marching band drums. 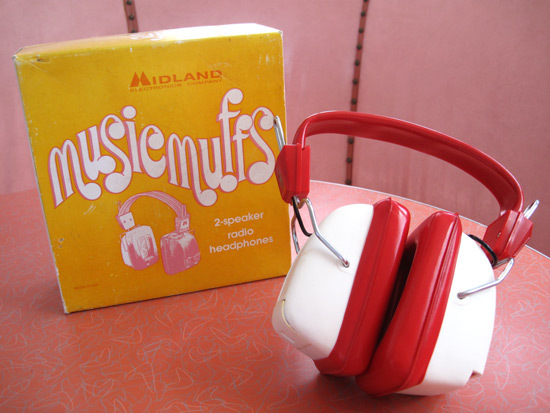 Not only do I have a vintage set as you can see in the photo at the top of this post but I have quite a few sets of them, including one we used in my current YouTube extravaganza, “Jungle Animal” by Pomplamoose and Allee Willis. 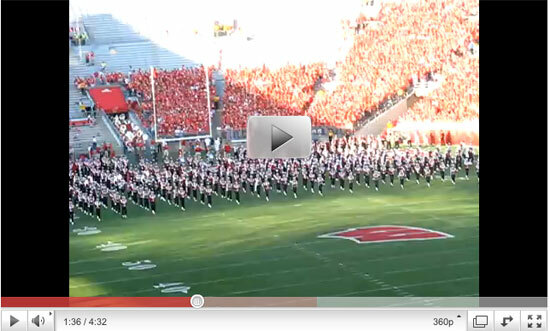 All of which is to say I’m pretty damn pumped about conducting the University of Wisconsin band. I’m a little concerned about falling off the conductor’s platform as from what I hear it’s just a few feet square, with no rails and 25 feet up in the air. I’m not one to be trusted not to move, between my natural proclivities to do so and the sheer psychologically altered state I’m sure I’ll be in in front of all those hundreds of musicians playing my own songs in my #1 favorite genre of music. I have no idea what I’ll attach myself to but I’m bringing extra strength bungee cords along to hook on to something so if I tumble I’ll just bounce. 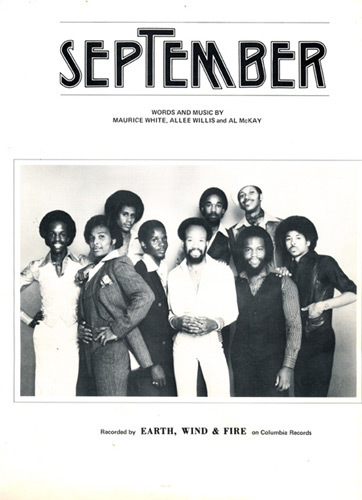 Knowing me, I’m pretty sure I can bounce in rhythm. 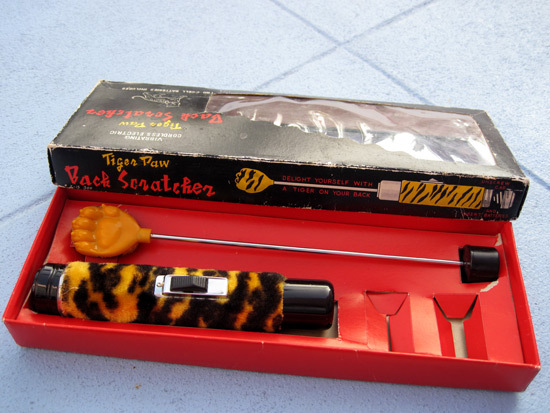 I used to love back scratchers as a kid, the long skinny brittle plastic kind that the hand snapped off of if you jerked them along your back too fast. I always loved the little lifelike looking clawed hands, fingers curled for maximum scratching action. I remember the first time I saw one of the battery-operated ones. I had already been made aware of similar looking battery-operated things though those didn’t have aluminum arms and teeny little hands attached to them. And none of them were near as elegant as this tiger skinned vibrating gadget. 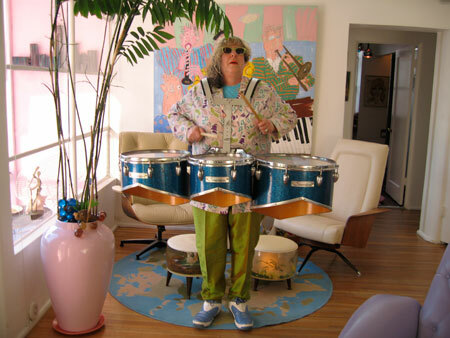 Allee Willis’ Kitsch O’ The Day – “Jungle Animal” (Theoretically) Coming Tomorrow! 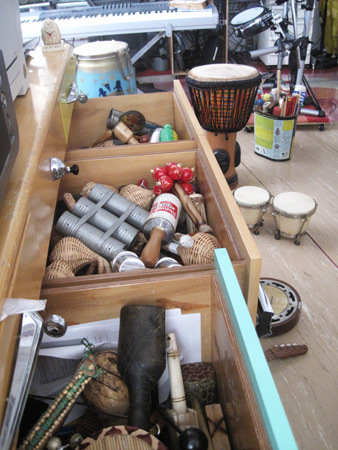 For the last few months I’ve been holed away in the creative jungle known as my desk trying to complete a long-distance collaboration with Pomplamoose, the YouTube sensation band I collaborated with after I saw them do a highly unusual version of my song, “September”. 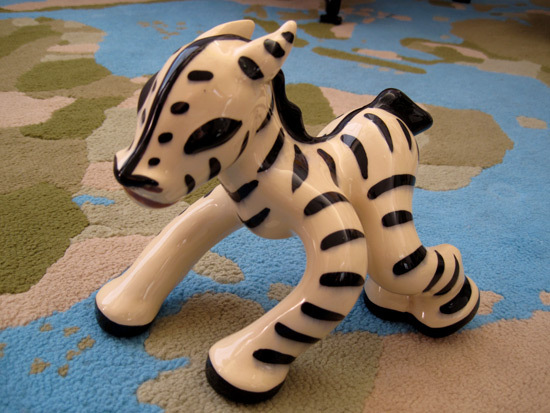 With “Jungle Animal”, a song and video we worked on together, as well as an online game that I whittled away at myself, theoretically just hours away from release, I thought that this off-kilter Atomic 1950′s zebra, knees buckling but still standing, was the perfect visual representation of what one feels like when they emerge from as intense of a workload as this. Yesterday, me and Mark Blackwell, who I work with, drove back to LA from up north in Sonoma where I was working with Pomplamoose. As I had raced through the last 48 hours to drive up there with a van full of props so we could shoot our “Shbaby” video, unloaded everything, danced and carried on like a lunatic for the video for much of the time, wrapped, re-wrapped and repaired instruments I had made out of foamcore, many of which weren’t happy taking the trip, singing and finishing tracks for another song, “R U Thinking”, finalizing our “Jungle Animal” video, racing back and forth to the hotel where someone who weighed at least 400 pounds was very fidgety in the room above me both nights… as all this was crammed into a less than 48 hour period I was drop dead T-I-R-E-D when it was time to head back yesterday morning. 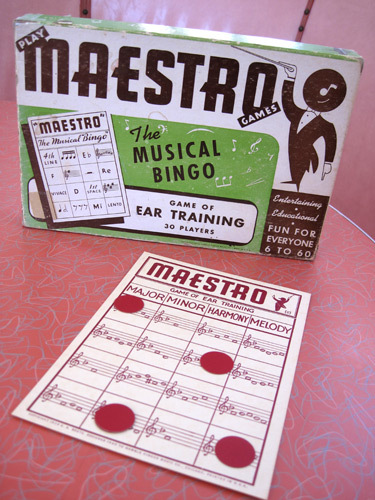 This game felt especially fitting because it’s supposed to teach you how to play by ear. Not only did I never learn to play by ear but I never learned to play period. 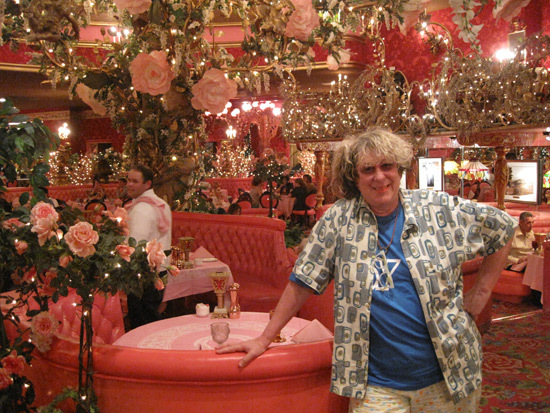 Which makes the fact that my songs have sold over 50 million records a very kitschy thing indeed! I don’t suppose this game will help me, though, as there are no instructions included. I was never good at following instructions with anything anyway which is why just about everything I do is so spontaneous and free form. Which is what I loved about Pomplamoose when everyone started sending me links to their version of my song,“September”. I sent them a message and asked them if they wanted to write something together, something I never do, but I thought they were so fresh and casual and inventive that it would be a good match. From the looks of their videos it looked like they already knew what this game had to teach. 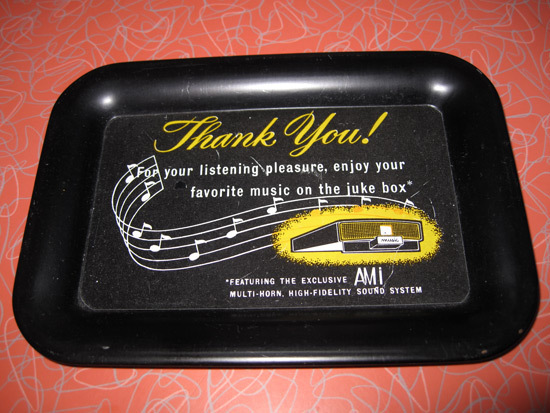 A petite 4″ x 6″, this little metal tip tray was a promotional item given away in the 1950′s by the AMI corporation to celebrate their massive line of exclusive multi-Horn, high fidelity sound system jukeboxes. It’s been sitting in my recording studio collecting guitar picks for as long as I can remember after originally being brought in as a drink coaster after I ruined several keyboards with an avalanche of Diet Coke, Yoo-hoos and decaf. Without question, these are by far my favorites of the 50 or 60 pairs of headphones that I own. Although of no use whatsoever in my recording studio as their sole purpose is to wear them to listen to the radio they still are the best looking set of phones I’ve ever seen. 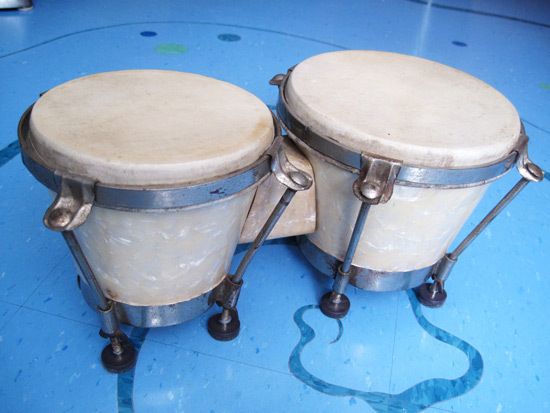 These 1950′s bongos with pearlized crushed ice wrap and heavy chrome hardware have been beaten on just about every song I ever wrote. If it weren’t for their bone crushing girth they would be in my suitcase right now as I’m on my way up to northern CA. 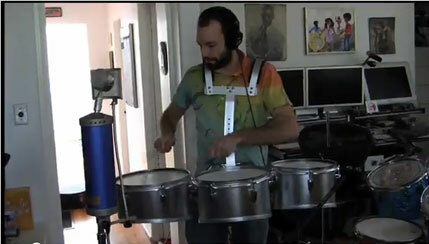 to finish six songs with Pomplamoose. My trip was postponed for a month so the suitcases on are back in the closet and the percussion is resting nicely in its regular bed.